These protests are organised against one of the clauses of the so-called Brussels Agreement, the one that guaranties the formation of the Community of Serbian Municipalities in the NATO-occupied province. Although most of the Brussels Agreement is in favour of the separatists, the ethnic Albanian opposition sees this as a compromise with Belgrade and a defeat of the Albanian side, maybe actually having a point in that. 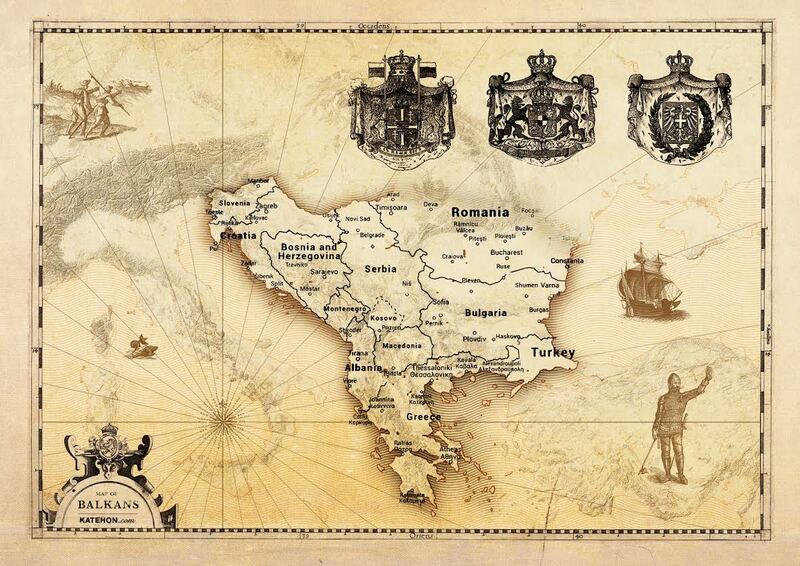 After the separatist authorities of Kossovo-Metochia and their sponsors failed to secure membership in UNESCO on 9 November, thanks to Russian in the first place, but also to Serbian diplomacy and successful lobbying, there is a sense of lost confidence among the separatist Albanians. It seems this was the point where things started to fall apart for the separatists. Backing this thesis might be the visit of NATO Secretary General Jens Stoltenberg to Belgrade on 19 and 20 November. Although this was in a sense very humiliating for Serbia, as he was greeted with great honour by Serbian PM, in spite of representing the organisation that killed thousands of Serbs in the past two decades, something very interesting, perhaps even strange happened. Stoltenberg to give back the access to 25km-wide sky belt around Kossovo-Metochia to Serbian Air Force. On top of that, on 21 November Serbian Chief of General Staff Ljubiša Diković—one of the most capable Serbian commanders during the 1999 NATO aggression—went to Prishtina to attend the signing of this agreement with NATO. This was a slap in the face to ethnic Albanians by their US sponsors. Another ‘benevolent’ US gesture to Serbia happened in Croatia’s capital Zagreb on 25 November, during the meeting of Western Balkan leaders, attended by US Vice President Joseph Biden and EU Council President Donald Tusk. Vice President Biden told Croats that they should behave well with their neighbours, having Serbia in mind above all. Biden also found understanding for Serbia’s position on never joining NATO that Serbian President Tomislav Nikolić expressed in Zagreb. Among other issues burdening the region, the future of Bosnia-Herzegovina was in the focus of the summit. On 26 November the Bosnian-Muslim dominated Supreme Court of Bosnia-Herzegovina made a ruling to cancel the national holiday of Republika Srpska (Serbian part of Bosnia-Herzegovina). By this they symbolically deny Republika Srpska’s right to exist. The response of the President of Republika Srpska Milorad Dodik was that a referendum will be held on that question. His dissension was supported not only by the majority in the National Assembly of Republika Srpska, but also by opposition parties. Simultaneously, protests are shaking pro-NATO government in Montenegro. The protests started this summer, lost some of its momentum after the police brutally broke the rally on 24 October, but they are growing these days all over the small Balkan country. The protesters want to see the Montenegrin despot Milo Đukanović out of office, but the real issue and motivation of the great majority of protesters is the identity question. The people of Montenegro are sick and tired of ethnic engineering by the pro-NATO government, which is trying to wipe out the Serbian identity of Montenegrins and to push the country in the direction of NATO that bombed Montenegro only 16 years ago. This is why people are waving Serbian and Russian flags in all the rallies. The most interesting question though is whether or not NATO will send the invitation to Montenegro on 3 December. The Đukanović regime placed all of its cards on NATO invitation and tries to prepare the whole society for that. If NATO does not call Montenegro, this would severely shake the regime, possibly leading to its political end. People surrounding Serbian PM Aleksandar Vučić are repeating for a week already that a ‘coup d'etat’ is being underway in Serbia, accusing some other members of Serbian government for taking part in this alleged plot. Above all, Deputy PM and Minister of Construction, Transport and Infrastructure Zorana Mihajlović, but also tacitly even President Nikolić. It is hard to tell how serious this is, because Vučić’s political style is to constantly make an atmosphere of crisis. He already proclaimed many false alarms during his three-year rule. In this peculiar geopolitical moment, this should nevertheless not be taken lightly. If Russian weapon systems are actually going to be deployed in Serbia this December, with Dmitriy Rogozin’s visit to Belgrade, as rumours suggested after the Serbian government’s high-level visit to Moscow in October, an abrupt destabilisation in Serbia could disrupt these plans. Another reason for destabilisation might be Vučić’s recent visit to China, where many large construction projects and investments were agreed and signed. This is however only a hypothesis. Vučić’s problem is ‘crying wolf’ so many times, so even if this is an actual threat, many people in Serbia would not believe him, for a simple reason that he and his media machinery stooges were scaremongering Serbian public so many times before. On top of all, the OSCE annual summit will be held in Belgrade on 3 December, attended by both Sergei Lavrov and John Kerry, among other senior officials of 57 member states. This mosaic of simultaneous games and micro-crises in the region suggest a larger geopolitical game being underway, connected to wars in Ukraine and Middle East. The American game is very strange and enigmatic. For last 25 years it was vehemently anti-Serbian. Although it remains such in general, some expressions of good will have been made; one of such was giving Serbia back full access to sky around Kossovo-Metochia to Serbia, essentially giving back part of the sovereignty. US policy seems to be led by two principles: (1) John Kerry’s ‘line of fire’ (between Russia and the West that runs through the Balkans) which essentially means creating chaos in the peninsula and (2) general US policy of shifting attention from the Balkans, Middle East and South Caucasus towards the Pacific. Creating chaos in Belgrade, Pristina, Bosnia-Herzegovina and elsewhere in the Serbian space might be a part of the exit strategy, in a way similar to the chaos that US imperial predecessor Great Britain left in India (the partition) and the Middle East during decolonisation. If they have to move, they want to create a situation where local powers would be in a permanent knot of conflicts and prevent other great powers from filling-in the geopolitical vacuum. All in all, December promises to be a very interesting month for the Serbian space.